Considered one of Italy’s most exquisite public gardens, Villa Bellini has a vast expanse of greenery laced with scenic walkways and dotted with pavilions, flower gardens, and hilltop viewpoints over Catania and Mount Etna. Located at the top of bustling Via Etnea, this public garden is a serene respite from the urban chaos and a city highlight. Walking and Segway tours of Catania generally include a relaxing stroll through lush 17-acre (7-hectare) Villa Bellini, also known as Giardino Bellini, paired with a tour along Via Etnea, the city’s main thoroughfare, which runs from the gardens to Piazza Duomo, home to the city’s famous Elephant Fountain and baroque Cathedral di Sant’Agata. Named for illustrious Catanian composer Vincenzo Bellini, Villa Bellini opened in 1883 and is known for its rich botanical variety, pathways shaded by sprawling fig trees and towering palms, and more than 100 varieties of plants and flowers. Villa Bellini is a popular gathering place for locals, so settle in on a bench here for some great people-watching, especially during the evening passeggiata (stroll). If you’re joining a walking tour of Catania, be sure to wear comfortable shoes, sunscreen, and a hat. The park is partially accessible to wheelchair users via paved pathways on the lower level; there are staircases to the upper levels of the park. The shady lawns and fountains at Villa Bellini provide a welcome break for families with kids. Villa Bellini is set along Catania’s main thoroughfare, Via Etnea, in the historic city center, an easy walk from Piazza Duomo and the Catania Centrale train station. Like all Sicilian cities, Catania gets very hot in the summer months, so head to the shade of the park during the midday hours. The park is also a popular destination for locals in the evening for a relaxing stroll and chat. 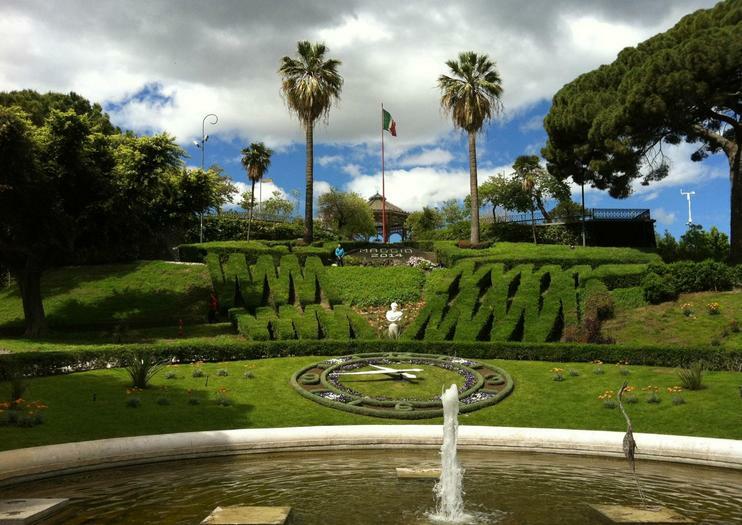 In addition to the delightful landscaping, highlights of Villa Bellini include the central fountain and floral clock; the Avenue of Illustrious Men lined with busts of historical Italian figures, including a bronze statue of Giuseppe Mazzini; and the hilltop bandstand, which hosts regular concerts throughout the summer months.